Toyota has contacted Jalopnik and informed us their company's perplexing attempt to claim rights to desktop images uploaded by users and hosted at DesktopNexus was the result of an "internal miscommunication" and they they offered a sincere apology to those at the site involved in the fracas. This is a major reversal. 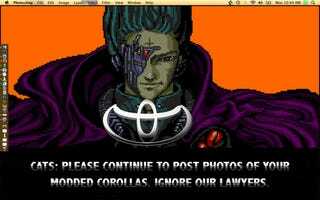 As recently as Moday the company's lawyers were threatening to pursue legal action if any desktop image with any Toyota vehicle was left on DesktopNexus. To Toyota's credit, they realized what a major publicity mistake they were making and quickly changed course before making it an even bigger story. The statement from Toyota below the jump.